Artist and educator Jacqueline Treloar studied textiles at the Central School of Art and Design in London. Upon graduating she was the recipient of a Leverhulme Travelling Scholarship which took her to New York, Paris and Rome. Travel remained an important element of Jacqueline’s work as an artist, as in 1969 she moved to Northern Italy, where she ran a textile design studio for 12 years. Since 1984, she has been a resident of Toronto; her work has been seen in exhibitions at a wide range of venues in Canada, including the John B. Aird Gallery, the Homer Watson Gallery, and the Museum for Textiles. We were attracted to Jacqueline’s work because of its boldness, ambition and sense of theatricality, and were keen to find out more. She speaks to us about the influence Italy has had on her work, as well as how she cleverly combines painting with textile art. Le Cirque – Jacqueline Treloar, 1989, 7 x 7 ‘, painted, cut and embellished silk panel. Corporate collection, Ontario Crafts 89 works by Award Winners at The Craft Gallery Toronto , Premier of Ontario Award for Excellence, 1992. To San Espedito for favours granted, The Carnegie Gallery Dundas, Ont. and the Craft Gallery Toronto Ont. Jacqueline Treloar: Good question! Textiles was originally chosen as a sculpture option while at art college in London. I then learnt to love its range, scope and possibility of dimension and tactile qualities. No doubt my years of working with and around some of the most prestigious companies and individuals in the Italian fashion printing industry left a huge mark. The level these companies worked at, their regard for excellence and the artisan tradition of fabulous hand work and skills (Ratti- Stucchi-Bini) were all hugely influential; the fabulous fabrics would then take to the runways for Roberto Capucci, Valentino and other Alta moda and prêt a porter clients. I studied in London and after my first entry year at Ravensbourne College in Kent, my professors (amongst them the fantastic fashion designer Zandra Rhodes) suggested I look at either sculpture or textiles as a degree course. I chose textiles believing that it offered me a slightly better chance at making a career and a living and then was accepted at Central School of Art (now amalgamated with St Martin’s College) and it went from there. I was lucky enough to receive a Leverhulme Travelling Scholarship upon graduating, which took me to New York, Paris, Como in Lombardy and Rome. I was offered work in Enrico Perroni’s textiles design studio right on the Como Lake and my life was changed. A huge recession ended that life in 1982 but I returned to Italy, this time Sicily in 1999, and it became my home from 2000-2003. Sicily’s power remains with me to this day and is a constant source of material in my practice. My diploma years at Central School of Art and Design (1965- 70) were magical years to be living in London and the school has a phenomenal central location near Holborn Kingsway. I got into the college on the strength of 6 pieces of work sent via airmail that I had done in a six week class in Calgary, Alberta where I graduated from high school – my only art training to date at that point. A prestigious Leverhulme Travelling Scholarship led to twelve years working in the textiles design profession in Como, a world centre in the business, and then returning to Canada in 1983, the skills I’d learned had to be applied to other avenues. It started off with painted scarves, ties and fabric jewellery and went from there into the first painted silk panels. La Beata Ludovica Albertoni – Jacqueline Treloar, 1993, 9 x 14’, painted nylon with lace, and beading. Yorkville Public Library, Wychwood Public library, the Church of the Holy Trinity, Visual Arts Ontario, 1994 Award of Merit, Juried Craft Exhibition, Art Gallery of Mississauga. I use a lot of mediums. My textiles work is often on large painted and embellished suspended panels of translucent nylon which are hung in sets. They are generally presented in large public spaces. I use fabric paints and dyes or acrylic paints and inks, cutting, stencilling, stitching and sewing appliqué often with the addition of any number of trims and assorted objects. I also build things with fabrics and so a third dimension is often a part of what I create. The Great Coat would be a good example of this and the Coronae crowns another. 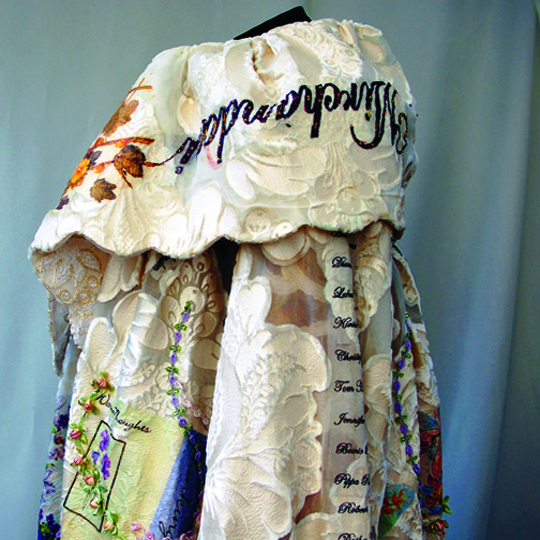 The Great Coat – Jacqueline Treloar, 2011, The Great Coat and the White Cat, Artscape Triangle Gallery Toronto – fully lined coat of cut nylon fabric with heat transfer images, beading and trims. The Great Coat (Detail) – Jacqueline Treloar, 2011, collar and left side detail, 26 x 24”, The Great Coat and the White Cat, Artscape Triangle Gallery, Toronto, embellished embossed and beaded fabrics. Corona Adultus – Jacqueline Treloar, Coronae Reginae Caeli 1, 2013, 16 x 14”. The Gladstone Hotel Art Bar, fabric crown with trims, beading and assorted artificial flowers, birds and butterflies. Corona Puer – Jacqueline Treloar, 2013, Coronae Reginae Caeli 1. The Gladstone Hotel Art Bar. Toronto 16” diam. fabric covered suspended crown with ttrims, beads and assorted artificial birds, flowers and butterflies. My best work I believe to be dramatic, theatrical and requiring space. It is made to draw the public to it and enter into the surface and often to move between the layers. It is generally rich in narrative and often historical context. Where does it fit in? I have no idea. What I do know is the public response is remarkable and pieces are often held over on location due to popular demand. I work in my studio which is on the top floor of the house where I live. It has a small balcony and bathroom and my nightmare is losing it as it is affordable and hugely convenient. No. I use my photos as a reference. I have painted watercolours on location which generally require lengthy stays and time. Huge question and a long list required for a decent response. I am returning to Sicily this summer and my solo exhibition in October 2015 will be a result of what I find there. I have already sent out requests to friends and people in a position to open doors to crypts and hidden places. I will most certainly be climbing Etna and revisiting the salt fields and the small island of Mozia near Trapani. Miniartextil Como carries a lot of weight with me and has shown work by Manuel Ameztoy, Argentina, Yinka Shonibare, UK and other amazing artists using textiles. I also follow the work of Rozanne Hawksley, UK, and Olga de Amaral, Columbia. Anselm Kiefer is a huge influence as I love his power, scale and his sources of inspiration. Those artists now past us who I turn to regularly are JMW Turner and Gustave Moreau. Maria Regina – Jacqueline Treloar, 1997, 12 x 7,‘nylon, acrylic paint, private collection Toronto, SS Giovanni e Giacomo, Art Gallery of Mississauga, the Church of the Holy Trinity Toronto. Maria Regina – from the exhibition SS Giovanni e Giacomo 1998. She is probably my first Madonna; the original is a C13 wooden statue in the Boston Fine Art Museum. I created a cathedral in memorial for lost friends in 1998 in a 2000 sq ft regional gallery and she headed the exhibition. The image is huge (12 x 8 ‘) and very powerful. It is a shame that she won’t be seen in public again as she is in a private collection in Toronto. I started my first pieces by copying old star maps and antique prints and recreated them as painted wall hangings. The subject matter then moved to my own photos and I started to cut and pierce the surfaces and to layer with canvas, nets and other fabrics. I then got bigger and more textural. I also began to construct shapes in three dimensions. Textiles art is only a part of my practice as I also paint but the two interlink a lot. The Holy Trinity church installation in May 2014 will have four 5ft diam suspended fabric crowns and they are most certainly my largest sculptural textile pieces to date. The following exhibition in October 2015 will be a mixture of canvases with an amalgamation of linen, fabric and painted surfaces and will take the concept of the 2008 exhibit further and more dimensional and tactile. We shall see and all lies in faith and hope. Follow your heart, keep standards and ethics high, keep looking and learning and be in love with what surrounds you. I used to get Lark books a lot but they have cut back. I really love their 500 series, some of which are textiles related; Fiber Art Today – Carol K Russell. I search the web a lot and my personal interests are varied so sites can run from design to architecture to obscure things like reliquaries. The newspaper art critic seems to have virtually disappeared in Toronto, so excellent blogs have taken over that role. I believe that the access we now have to reach out internationally and independently of others is a huge asset and how I discovered your wonderful resource. I give talks and lectures. I generally present a lecture at large exhibitions and also in public spaces upon request or by arrangement. These are very well received as I have now built up a following that comes out to attend. I run 6 week classes a term in my Toronto studio and also run daily and 2 day workshops at the Artscape Youngplace Centre, Toronto. I always need to look at finances (what can I afford), what else is going on in my life, and then I think about timing, location, floor plans and amenities, and what else may be going on at that time of year in my art community and the city. I then submit my applications. At present I have exhibits booked through 2015: May/June 2014 at the Church of the Holy Trinity, Toronto and October 2015 at the new TAC Art/Work Gallery, Toronto. To find out more about Jacqueline Treloar visit JaTreloar.com. Your magical results are certainly not obtained by magic. Awesome!